Foil stamping is the application of pigment or metallic foil to the cover material where a die is stamped onto the foil. 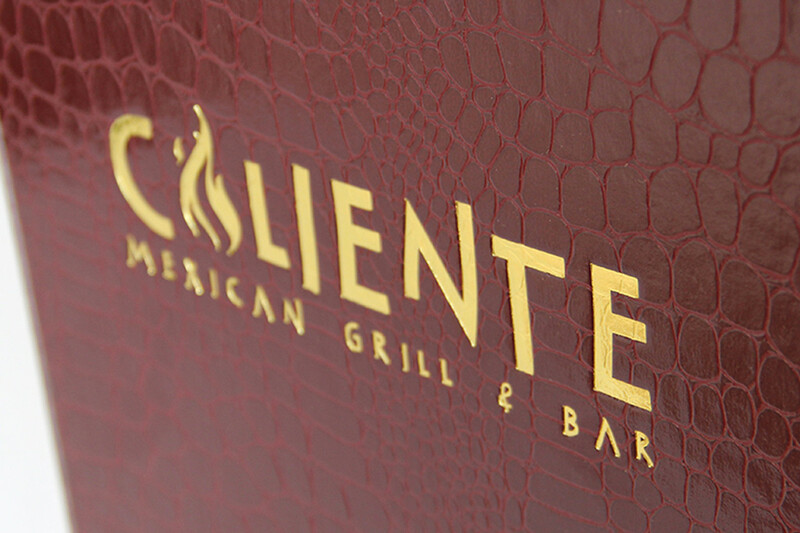 The foil adheres to the surface of the menu cover, leaving the design from the die on the material. We offer an extensive selection of foil colors from the traditional metallic silver and gold to green, turquoise, orange, purple and more. Please see individual products for foil color options. All new orders with artwork to be foil stamped require a $99 Foil Stamp Setup Charge. We create a permanent metal die and keep it on file for your future use at no charge. Most of our products can be foil stamped. Please see individual product for foil stamping availability. For projects requiring multiple foil stamps, one $99 Foil Stamp Setup Charge is required per color. Each additional color also requires a stamping charge. Please see below.